Debatable: Brent Chappell, John Chappell and Akinola Akinlawon present their case regarding the ethical dilemma presented to them as a part of the Ethics Bowl. The event took place on Oct. 4 in the Cynthia S. Ross Hall. 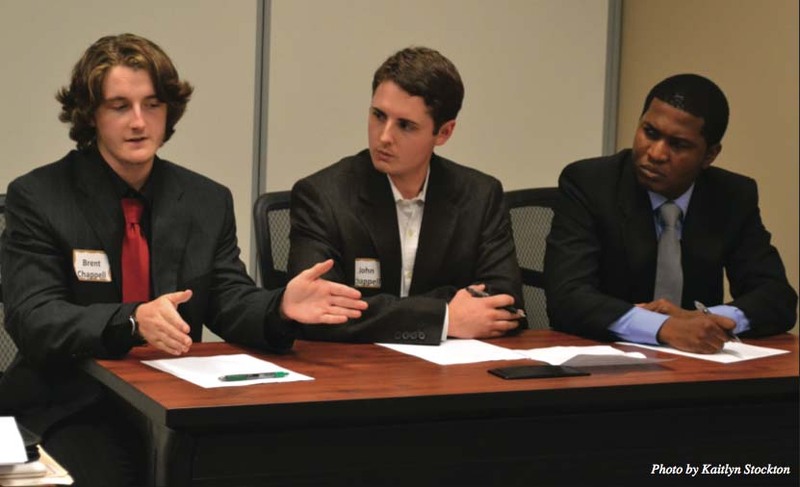 On Oct. 4, Cameron University held its first ever CU Ethics Bowl. At 1 p.m., CU students, faculty and community leaders gathered in Ross Hall to create a new tradition at the university. Fourteen student teams discussed and debated various ethical dilemmas in hopes of leaving the event with trophies for their respective departments and with a prize. The Phillip L. Jones Endowed Lectureship in Ethics, The Lawton Constitution, CGI Federal and Walmart sponsored the debate. Associate Vice President of Academic Affairs Dr. Sylvia Burgess hopes the CU Ethics Bowl becomes an annual event. Burgess said her idea for the debate came from taking students to other ethic bowls throughout the state. After returning, she knew there was a place for this academic competition at CU. 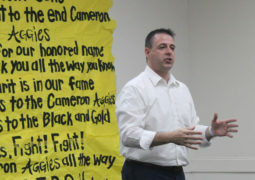 To judge the competition, Burgess enlisted the help of 24 community leaders. While these well-known individuals from different fields would help decide the winners of the event, they also provided students the chance to meet prospective employers. Local celebrities like KSWO’s Monte Brown and various vice presidents of local banks attended the event; students were allowed to interact with the individuals and partake in networking opportunities. On the day of the event, the teams from different departments and majors gathered to begin the three rounds of the CU Ethics Bowl. Two groups were spilt into different rooms for each round. In each match, the first team presented their first case, and the next team rebutted. The judges then asked questions. The teams switched, and the sequence began again. The judges completed their results. The next round ensued, teams switching to compete against others. Three members of MathCom competed as one team in the competition. Akinola Akinlawon – one of the group’s team members – said he believed his group would do well during the debates as they had practiced the case files throughout the past few weeks. The teams were given six cases to study before the day of the competition. Each case featured an ethical dilemma. However, the topics were not of the everyday variety. The issues covered such subjects as selling bone marrow, plagiarism and HIV criminalization. Each case was structured so students would be able to see and argue from both sides of the dilemma. At the end of three rounds, the total scores were tallied, and the winning team was determined. Team Criminal Justice Phi won the CU Ethics Bowl and was surprised with a special treat. Composed of Communication and Criminal Justice majors, the team won recognition and trophies for both departments. Its members – Steven Haber, Zakariya Rajpari and Skylar Williams – also left the event with three iPads donated by the event’s sponsors.